Considering that Naim waited the best part of a decade before producing its first CD player, the speed that the company has adopted hard drive and audio streaming products is impressive. In the last few years, we have been treated to the HDX hard drive server, the 'NaimNet' multiroom system and the Uniti all-in-one system with streaming capability. The Uniti has now morphed into a complete range of products with the Uniti Serv, CD-ripping music server and the product tested here, the all-in-one streamer/player, the UnitiQute. 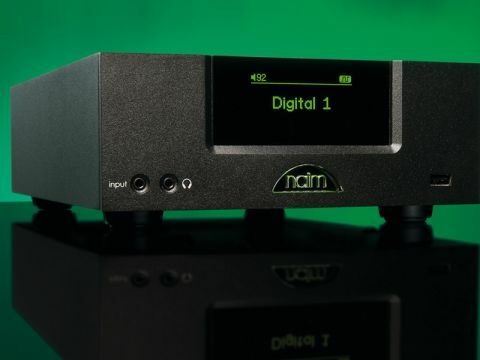 Finally, Naim has just announced the NDX streamer. The UnitiQute is a half-width version of the full-size Uniti. As well as being able to stream files up to 24-bit/96kHz in size via Ethernet or wireless network, the UnitiQute also has a DAB/FM internal tuner, built-in 45-watt amp, digital inputs, internet radio access and a USB input with the ability to access both stored files on a USB stick or an iPod or iPhone directly. The one feature that has been removed in the move from full-width Uniti to UnitiQute is the CD drive. The UnitiQute is entirely dependent on music being elsewhere – be it on a network, via a digital input or over the airwaves, or the internet. The Naim can then output any of these sources via the internal 45-watt amplifier, a pre out or via a digital output. This is also the first Naim product we recall seeing that has no DIN connections on the rear panel. Lack of DIN plugs aside, there is little danger that the UnitiQute will be confused with any other companies' products. The casework of the unit is every bit as solid as the rest of the Naim range and is non-magnetic and non-resonant. The display is a reassuring green and the illuminated logo is retained as well. Other Naim trademarks, such as the switchable chassis ground and lack of standby switch are present and correct. Indeed, besides a hard power switch on the rear panel, the UnitiQute has no buttons of any kind. All control is via the supplied remote or via the iPhone app, so be sure to put the remote somewhere safe. The overall impression of the UnitiQute is, that despite being rather different in functionality to more classic Naim offerings, it is still very much a Naim product. This extends to the run-in period, which whilst brief by Naim standards, is rather longer than might normally be expected of an all-in-one system. As the Naim is very dependent on networks and the web to show what it can do, it is good news to report that set up proved straightforward and is reasonably well explained in the manual. For review, the UnitiQute was asked to find material stored on a network attached storage (NAS) drive that was connected via Ethernet to a router. Later on, a laptop was set up as a UPnP server, much like the NAS and the UnitiQute was instructed to find content on it. In both cases, it was able to locate music content quickly and effectively. Naim recommends using the Ethernet connection on the rear panel for improved performance and stability and, if you have the wherewithal to do so, such a network should prove very resilient, in practice. We also used the wireless connection extensively and provided that the router being used is relatively robust and the network itself is not being asked to do several very complicated tasks at once, the results are broadly indistinguishable from the Ethernet socket. The functionality, build and ease of set up make the UnitiQute a strong proposition at the asking price, although as a relatively new type of product, it will prove a little confusing to some. The digital inputs, internal tuner and iPod support strengthen the appeal and make the unit capable of performing as the hub of a relatively complex system. Considerable effort seems to have gone into making the UnitiQute a straightforward device to operate. The menus for set up and track selection are logical and easy to follow and the remote is easy to understand and intuitive. The green display can become slightly hard to read at a distance when the smallest size text is being displayed, while the default time the display stays visible for is a little short, although easily adjusted. After a period running in, we installed the UnitiQute on a wired network and connected it to a pair of Mordaunt Short Mezzo 1's. The initial and indeed lasting impression is the UnitiQute is still every inch a Naim product. It is possessed of a very assured presentational style with superb timing and the characteristic Naim bass 'grip' that has marked most of their products out for years. The overall presentation is fractionally forward of neutral, but this makes itself felt in a sense of excitement rather than any real harshness or stridency. The internal amplification has enough power to drive most pairs of speakers that one would expect to see used with this sort of system. Pushed very hard, the sound will start to harden up, but not until you have reached levels that are on the high side for domestic purposes. Given a lossless FLAC or WAV file or even better, a (regrettably rare) 24-bit/96kHz high-resolution file, the UnitiQute has excellent tonality and timbre. Voices are tangibly real and have a welcome sense of air and space around them. Instruments are well-placed in relation to one another and whilst the presentation is still fairly 'left/right' in the Naim tradition, there is a believable sense of three dimensionality to proceedings. Switch to compressed files and the UnitiQute retains much of this positive behaviour, although by the time bitrates drop much below 192kbps, the presentation will have become rather flatter and thinner than with lossless files, but this is not the fault of the UnitiQute and generally thoughtfully compressed files remain extremely listenable. The same behaviour is applicable to the digital inputs which did a fine job with the varying quality and material available from our Sky HD box, which is typical of the equipment likely to be connected to a device like this. The internal tuner proved virtually noise-free and easy to tune. It is, however, overshadowed by the excellent internet radio implementation, which is one of the best we have seen. The UnitiQute has an extensive database of stations which can be searched by genre and country of origin. Connection proves fast and reliable, but more importantly, stations with a bitrate of 192kbps or above – particularly AAC codec – based ones – are comfortably superior to DAB. Further stations can be requested via the website and the overall experience transforms internet radio from something of a novelty to a genuinely worthwhile listening experience for all. The UnitiQute is very well thought out, well specified and, most importantly, capable of a strong sonic performance. To anyone with an existing network and their music already stored on a NAS drive or similar, there is very little that can match its performance and features, let alone the form factor at a similar price. The biggest issue that the UnitiQute currently has is not performance-related, but more down to the fact that currently the only real way of buying music that does the UnitiQute justice is via CD. This means that most would-be owners will have to purchase a format that the UnitiQute cannot play directly. This is not to say that there is no high-quality music out there to download (Naim itself has a better selection than most), but the UnitiQute is essentially waiting for the music retail market to catch it up. For some, this will mean the UnitiQute loses out to products still capable of playing CDs. Others, however, will be ready to make the jump.